Manufacturers far and wide have long dreamed about providing increased sensory feedback for one's PC sessions – mostly movies and gaming. We've seen devices that try to emulate the smells of locations you're slogging through (perhaps the worst idea ever for games like Prison Architect, but we digress). We've seen devices that basically try to automate house fans to provide the illusion of breeze, noise, and rumbling depending on your environment (perhaps the worst idea ever for games like Dirt 2, depending on how much of a lead foot you happen to be). And, of course, there's lighting: If you'll allow this writer to get personal for a moment, I'm currently running a pair of lights that automatically project a pleasing, matching background wash to match whatever happens to be on my screen. Disney, it seems, wants to one-up all of these attempts at increasing one's immersion in a digital environment. According to Co.Design writer Mark Williams, Disney Research is currently working on a project called "Aireal" – go ahead and get all The Little Mermaid jokes out of your system now – that's designed to allow gamers and viewers to feel objects and textures in mid-air. 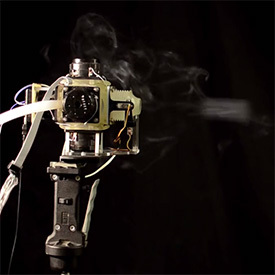 A device that looks like a "cigar-smoking Microsoft Kinect," as Williams describes it, puffs out tiny vortices of air at players, which helps to simulate the effects of pushing a button in mid-air or, to use Disney's example, touching a virtual butterfly that's flapping around on one's arm. "The hardest challenge there is to make these air rings consistently," said Disney Research's Ivan Poupyrev in an interview with Williams. "There's a very narrow range of parameters at which they're stable. Push them too hard, they collapse early. Not hard enough, they won't fly. Once you find the balance, though, it always works. It's the laws of physics. And it's inexpensive--just five speakers and a box." Multiple Aireal devices can be combined to increase the potential simulated effect – like a flock of seagulls flapping their wings around one's head, to use another example. Users don't have to wear or interact with any special device in order for Aireal to work and, according to the device's SIGGRAPH description, Aireal is both "scalable and inexpensive." Two setbacks identified with the device thus far include the sound it makes when the air puffs out — which might be addressable (which is to say, muted) in future iterations of the device. Additionally, there's a wee bit of a delay between one's movement and the device's tracking. 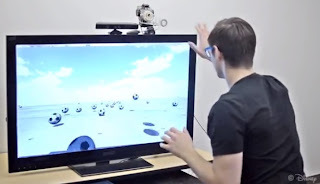 Perhaps the biggest issue for gamers, however, is the device's future: There's no suggestion as to when or if Disney's Aireal technology could hit the market, as much as one might love the idea of an air blaster attachment for one's PlayStation Eye or Microsoft Kinect. "Star Wars II" Being Unveiled in "Angry Birds"
"Star Wars" Characters to Kingdom Hearts? Fan Film Week: "Deadpool: A Typical Tuesday"
Disney to Viacom "We want Our Heroes Back"